When thinking about holidays each person has their own preferences and priorities. However, it is safe to say that the general consensus definition of a good holiday must satisfy most, if not all, your senses. Your holiday should be abundant in beautiful visuals, aromas, scents and flavours; it should be full of exciting sensations brought about by entertainment options and location exploration; it should leave you utterly replenished, completely recharged and full of tactile memories. The choice of destination greatly depends on the type of vacation you are after; you may want an all-out luxurious holiday featuring spectacular views, or a high-energy holiday that entails blowing-off some steam, or alternatively you may want ultimate relaxation, away from the noise and commotion of daily life. The Mediterranean offers this, and much more, in the heart of its own. Greek destinations are leading the way for offering individual travellers experience-filled holidays. 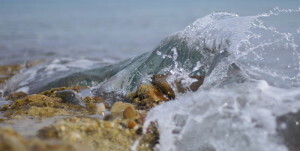 There are three destinations that will tantalise your senses: two islands, Mykonos and Santorini, that are in close proximity to one another and connected by air and sea, and Halkidiki located in the Northeast mainland of Greece, accessed via Thessaloniki. The ‘island of winds’, as it is known amongst locals, has been a favourite for celebrities and high-profile visitors for the past 60 years at least. As trends change with time, Mykonos always keeps up, meeting the demanding expectations of the contemporary visitor every time. Ultimately it is a jet-set destination, where celebrities go to have luxurious fun and to be seen. SEE: It has a multitude of idyllic beaches that are a frequent stop for celebrities such as Psarrou and Elia, and others that offer similar beauty but are less ‘posh’ in terms of the beach-goers such as Platis Gialos and Agios Stefanos. Notorious landmarks of the island are the many Windmills of Mykonos, which are part of Mykonian heritage and add to the charm of the island, the Armenistis Lighthouse and also the Little Venice area (a very elegant neighbourhood) where you can watch the sunset while enjoying a cocktail. HEAR: Its reputation as a party island precedes it, so the buzzing night-life in Mykonos can be considered as a powerful given. Clubs and bars are scattered all over the island with some in the town and others on its infamous beaches: ‘Paradise’ and ‘Super Paradise’ host the homonymous beach clubs. These are truly a clubber’s paradise frequently bringing world-class DJs, and blasting dance music from dusk to dawn, offering non-stop partying! SMELL & TASTE: You must try the local traditional dishes Kopanisti (creamy cheese dip), Louza (cold meat cured with herbs and spices) and the sweet Amigdalota (almond cookie bites). FEEL: Like a star! The influx of jet-set and creme-de-la-creme visitors over the years has lead to Mykonos holding the reins in luxurious accommodation, where you can further personalise your holiday. Staying at Alegria Mykonos was the perfect location for arranging for private yoga and personal training sessions, elegant and private. Mykonian hospitality has a long tradition in catering for international stars and so, it has developed its own sophistication and style when it comes to offering a high-class holiday. It is something that you must experience for yourself. 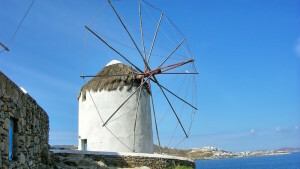 Panoramic view of iconic Mykonos Island Windmills, Chora. Cyclades, Agean Sea, Greece. Of all the Greek islands, Santorini’s natural beauty is the most astonishing. Formerly a single island before the volcanic eruption, Santorini is part of the Thira regional unit that also includes Therasia, and the non-inhabited Nea Kameni, Palaia Kameni, Aspronisi, and Christiana. Although phenomenally destructive, the eruption left its astounding mark on what remains. SEE: The Santorinian Caldera, created by the eruption, is the massive cliff that is opposite the old volcano site, Kameni. This dramatic physical precipice is the setting for your ideal vacation offering serenity, privacy and magical views from the elegant Astarte Suites that will remain with you forever. The steep colourful cliffs will charm you, and whitewashed blue dome churches will intrigue you, while the incomparable sunset in Oia will move you; sunset views from Santorini have been described as being some of the best in the world (and this is not an exaggeration). Santorini is an island you will fall in love with, fall in love in, and will want to return to, time and time again. The volcanic landscape has created some unbelievable beaches: the Red beach, the White beach and Vlychada beach, each being very particular in their sediments and appearance. SMELL & TASTE: Wine-tasting in Santorini is a must-do as the vineyards there produce a local sweet dessert wine called Vinsanto, which is the island’s version of the tuscan variety Vin Santo. It is more golden than it’s amber relative and is made from sun-drying Assyrtiko and Aidani grapes. Vinsanto is made by numerous wineries in Santorini, so if you consider yourself as a bit of a sommelier, there are many different ones to try! Also traditional local produce such as cherry tomatoes and white eggplants are used to create Santorinian delicious specialities including domatokeftedes (cherry tomato patties), and melitzanosalata (white eggplant dip) plus many other meze dishes. HEAR & FEEL: The aura of the ancient civilisation that was; before the violent eruption of the volcano, the Minoans had a settlement on the island during the Bronze Age and you can visit their ruins, pottery and frescoe remnants at Akrotiri. More recently, Santorini has been considered a strong contender for the location of the mysterious city of Atlantis. Does that sound right? Visit and find out for yourself. 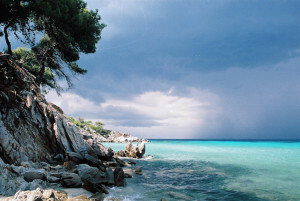 Located near the city of Thessaloniki, in the North of Greece, you will find Halkidiki, a peninsula that has all the attributes of an island, but also hides a treasure in its’ earth’s depths. Halkidiki, and especially the region of Kassandra, is a source of thermal springs that are renowned for their holistic healing properties. This is why the Miraggio Thermal Spa Resort is much anticipated. SEE: Natural treasures: The Cave of Petralona or cave of the red stones is a natural marvel and features impressive stalactite and stalagmite formations, also preserving a human skull! The Lake of Polychrono is a pristine lake surrounded by luscious pines and is natural reserve and home for the Testudinata Turtles. SMELL & TASTE: You must taste local delicacies, as Halkidiki has superior quality honey, olives and olive oil, as well as giving their own localised touch to pies and cheeses. In particular, a dish that you will not find anywhere else is Sardines with shallots, cooked in baking paper to retain all the flavour. Also, the locals have taken liqueur brewery to the next level as they have concocted the most peculiar of flavours, thyme liqueur among others. HEAR & FEEL: Listen to the glistening Aegean sea lapping on the shore from a magical location where luxury meets nature. Feel the beauty of the location transcend you, and surrender your body and mind to absolute relaxation by experiencing specialised treatments, while enjoying the natural hot spring ground water.